David T. Bourgeois is the associate dean for undergraduate programs in the Crowell School of Business. Dave graduated from Biola with a degree in mathematics in 1987. For the next 15 years, he worked in the information systems field with four different companies, including two Fortune 500 companies, experiencing many different roles within this field: systems analyst, programmer, project leader, trainer, consultant and help desk support analyst. 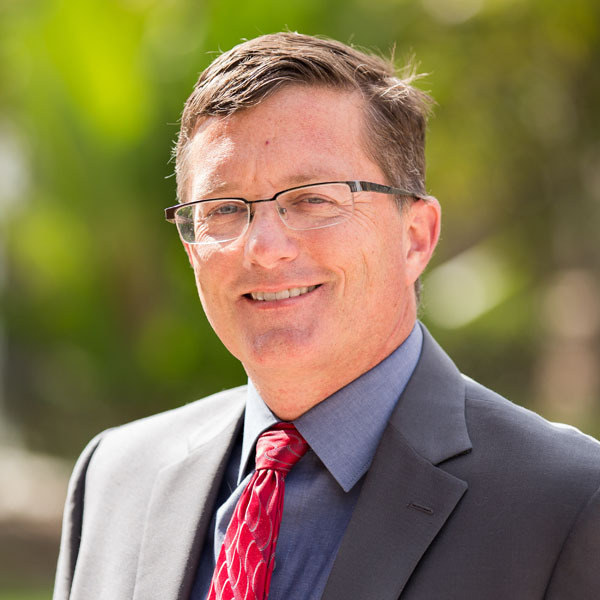 Dave completed his doctorate in information systems and technology in 2006 at Claremont Graduate University, and joined the Crowell School of Business faculty as an adjunct in 2002 and became full time in 2003. Dave teaches courses related to digital technologies and business analytics. He remains active in the business world doing consulting fields related to his interests. His research interests are in the areas of faith, education and technology, and how these can be combined effectively. Dave married his Biola sweetheart, Marne, in 1991. They have six children and live near Biola in the city of Brea. Ministry in the Digital Age. Intervarsity Press, 2013. ISBN 978-0-8308-5661-9. “I luv u. Will u mrry me?” Biola Magazine, Spring 2013. “A Design Theory Approach to Community Informatics: Community-Centered Development and Action Research Testing of Online Social Networking Prototype”, Journal of Community Informatics Vol. 3 No. 1 (2007), with Thomas A. Horan. Dissertation: “Building Social Networks: Action Research on Design and testing of Online Systems in a University Setting”. UMI 3223795 (2006). “A Design Theory Approach to Community Informatics: From Kernel Concepts and Social Applications”, presentation at HCI 2005, with Thomas A. Horan. Christian Leadership Alliance conference – Ministry Internet Technology Summit session leader: “Using Digital Technologies for Education and Discipleship”. Orlando, FL, April 2012. Christian Leadership Alliance conference – Ministry Internet Technology Summit session leader: “Research Strategies for Online Ministry Success”. Dallas, TX, April, 2011. Christian Leadership Alliance conference – Ministry Internet Technology Summit session leader: “Online Ministry Opportunities, Challenges, and Lessons”. San Diego, CA, March 2010. Turkey Internet Evangelism Network Conference keynote “Best Practices in Internet Ministry” and others. Istanbul, Turkey, March 2010. Indiana Center for Congregations, March 2009: presented a workshop on church Internet strategy to over 70 congregations. Internet Ministry Conference Keynote speaker, presenting my research on “Best Practices in Internet Ministry”. Grand Rapids, MI, 2008.